We were delighted to attend The Law Society’s excellent Risk & Compliance Conference 2017 at Victoria Park Plaza in London. The maturity of AML/CTF compliance processes and risk teams within professional services is fast catching up to its financial services counterpart. This year’s Risk & Compliance Conference was focused on the current responsibilities law firms have in relation to risk, and how to ensure firms are ready for the new changes in compliance regulation. We’ve put together five key takeaways from the conference on what we learnt. With the new AML regulations coming into force this June, simply checking a company’s registered information using one database (usually Companies House) won’t be enough. All checks must be done using a minimum of two data sources, and in certain cases this will be increased to three or four. Firms who have ongoing business with people or companies may think these clients and the matters arising with them are exempt from the new regulations because of the historic relationship with them. This is most definitely not the case, with firms having to review their back book of clients and apply the same level of due diligence as if they were new business. Firms must run investigations to establish whether or not a client is low risk. It will not suffice anymore to rely on prescriptive exemptions, eg knowing that a company is listed on the Stock Exchange and thus regulated. You will have to run the checks and get the documentation to prove that a firm is regulated which then means you can apply Simplified Due Diligence. If Britain fails to reach a trade deal with the European Union after Brexit, it will have to fall back on the WTO. This could possibly mean yet another re-draft of the latest AML/CTF regulations meaning the legal industry will be faced with the prospect of a new regulatory regime that can affect how law firms run their business. The legal industry needs to stay alert and have to be dynamic in responding to these changes. The addition of the new Office for Professional Body Anti-Money Laundering Supervision, it has been suggested as lawyers are considered high risk in terms of facilitating Money Laundering and new Supervisor highlights the need for lawyers to up the ante in their compliance. There were certainly a number of questions posed and there is still a lot of uncertainty within the profession as to the extent of change which will need to be applied. We had a number of conversations with colleagues who were unsure how many of these changes will apply to them. 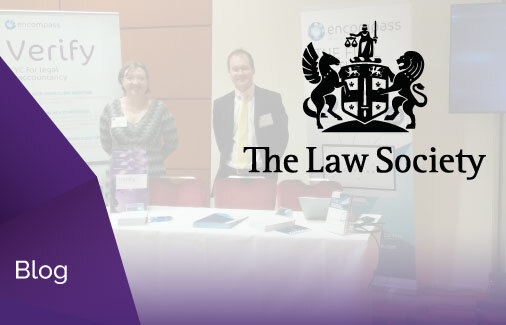 Friday’s conference made it very clear that all law firms need to have systems in place before June this year to become regulator ready in light of the scrapping of previous AML prescriptive exceptions and the move to a risk-based approach with the requirement of due diligence at its heart. Contact us today to arrange your personalised demonstration of Encompass Verify. Discover how our KYC automation software can help your business accelerate onboarding and give you peace of mind that you are regulator ready.